Thank you for visiting 1-888-NO-UNION.COM. We realize that your first instinct in visiting a site that is opposed to today's unions may be shock, anger or, perhaps, mere curiosity. However, you need to know that being opposed to today's unions is not anti-worker. You see, unfortunately, there is a huge difference between unions (and what they were founded for) versus today's unions�which have become a huge industry, often to the detriment of the workers unions were presumably founded to help. We believe, as you probably do, in the principle of voluntary association�that individuals should neither be forced, nor compelled, to do anything that is against their will and that applies to all citizens, regardless of class or station in life. Sadly, in our opinion, these views are not shared by the leaders of today's unions. You'll find that this site is designed to provide information that most workers (union or union-free) rarely ever find. As you browse this site, you will likely discover more about your rights and the union you belong to than your union "leaders" would ever let you know. If you're like most union members today, you never had a choice to become unionized as the union was already in the workplace when you hired on. So, when you went to work, if you live in one of the 28 states without right-to-work laws, becoming a member of the union was just something you were told you had to do (or you'd lose your job). And, if you're like most union members, you pay your dues loyally every month, month in and month out, year after year. You go to work every day, you show up on time, and you do your job, then go home. You are what is commonly called "the 90 percenters." This is the 90% of union members who pay dues to the union who then spends your money on the bottom "10 percenters"...the people who don't show up to work on time (if at all), do a lousy job, and make the rest of the union members look bad. This is a problem that many of us recognized while we were in unions as representatives and leaders: The vast majority of workers who are union members don't necessarily need to be in a union. Why? Because, if you're a 90 percenter, most of the union dues that you pay to the union are used to represent the laziest 10%. If you've ever seen the Wizard of Oz, you may remember that Dorothy, Toto, the Tin Man, Cowardly Lion, and Scarecrow (the characters) went on this perilous journey down the yellow brick road to find the Wizard. Once in Oz, though, Dorothy & the Gang found that the powerful Wizard they were looking for was really a broken down old man whose main message to Dorothy & the Gang was: You've already got what you were seeking. It may also surprise you to learn that, as a union member (even though you pay union dues) the union does not have to represent you on the job to your liking. You'll see that with many of the Unfair Labor Practice charges we've made available on this site that have been filed by union members for the union's alleged "failure to represent" them. But what about "evil" management? Like many of you, we were indoctrinated with the belief that management is always out to "screw the working class." Unions instill this belief in members to ensure the unions' job security. Unfortunately, there is a common mistrust on both sides and it is not likely to go away as long as there is an adversarial relationship in the workplace. There are approximately five million employers, large and small, in the United States. Of course there are "bad" employers out there. However, the vast majority are not "bad" or "evil." Employers, however, are managed by people and (probably like you) people do make mistakes. In fact, in most of our cases, learning that most "managers" (including corporate chieftains) are not "evil" came as somewhat of a shock. For most of us, there wasn't one defining moment that told us to "get out." Rather, for most, it was a build up of disgust at what we saw from union bosses who cared more about their power base and politics than how their members were doing. We understand that some of you may still be trying to reform your union and may be thinking now, "we are the union" and that "we, the members" can reform the movement for the benefit of the members. However, many others have nobly tried that approach only to find out that the higher you go, the less interested the established bureacracy is in reform because it means a loss of power to them. To us, there is something drastically wrong with that picture. Our conclusion? In order to help workers, we needed to do it from the other side. Since many of us have left the union movement, we've found that we've affected more positive change on behalf of workers than it would have taken in several lifetimes had we stayed in the union movement. America is at a precarious time in our nation's history. In the last 25 years, we have seen many of our nation's traditional (and unionized) industries decimated by competition from domestic and as well as foreign competition. Big Steel, the textile industry, the auto companies, unionized trucking, and other heavily-unionized industries are but a shadow of their former selves. Millions of jobs have been lost. While you may have been led to believe that it's "Corporate America's" fault, the reality is, the structural shifts in America have been a societal shift that has wiped out corporations as well as unions and unionized jobs. Unfortunately, today's unions, with their mid-20th century mindset are only making it worse. 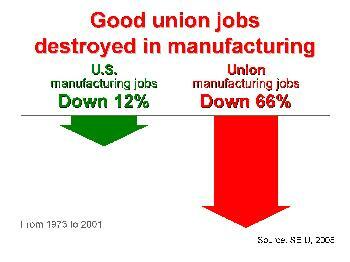 The graph above is a telling slide from a PowerPoint presentation that SEIU boss Andy Stern used in 2005 as we he was arguing to break up the AFL-CIO. Unfortunately, apparently no one bothered to question why union manufacturing jobs were lost compared to overall U.S. manufacturing. Union bosses apparently have never bothered to question whether or not it was, perhaps, the unions themselves causing the decline. And, for those that do recognize their own culpibility in destroying those jobs, they refuse to admit it publicly. Instead of looking inside themselves and their business model and accepting some of the blame for killing so many jobs, union bosses have determined that they need a "big union bailout" in the form of the misleadingly-named Employee Free Choice Act. This bill, if enacted, will be a disaster for America's workers�a job killer. Why? If anyone (either from unions, their allies, or from the government) believes that a small company in a competitive environment can withstand the weight of unionization when its competitors are not unionized without laying off or closing down, they're not familiar with market economics. Further, if those same EFCA pushers think that big companies will sit idly by and let the federal government dictate wages and benefits, they're mistaken on that front as well. So, as you take a look through this site, as a union member, you should know that this site not about you. But it is about the current state of today's unions, their effect on workers, and the union bosses who take money from you. We know that you may not agree with our viewpoints. However, regardless of what you may hear from the union bosses who take money from your paycheck every week, this site has been established to give you (and other employees) information about your rights and unions in general.